Paloma, our motorhome has once again taken up residence on a campsite! Not our usual choice as we prefer to head for free spots or motorhome aires as they normally provide everything we need, but being in a big city we prefer the safety and security that a campsite offers. 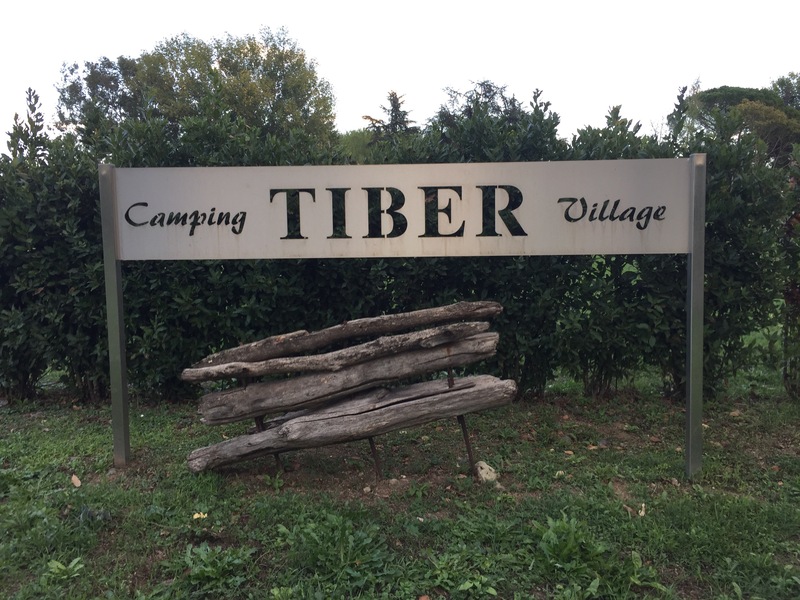 Thankfully for us the site we are on at the moment Camping Tiber is a member of the ACSI discount scheme, which allow us access to campsites out of high season for set prices, for example this place is discounted from around €40 to €19 !! The beautiful peaceful (absolutely no road noise) and green site sits just off the Rome ring road and has a Train station just up the road,which for €1.50 each, we can buy 100 minutes of travel, enough to not just reach the centre, but pretty much reach whatever part we fancy….. But today we are not visiting the heart of Rome or Roma as it’s known here in Italy but crossing into the what is the smallest state in the world by both area and population. A whole different country, of sorts….. Yes Folks we are tackling the mind field that is the Vatican City. As we exited the metro line A station,Ottaviano-S. Pietro we entered tour tout and tat seller hell, ok not exactly hell, no fire or damnation but it was like running a gauntlet just to stay alive,with-touts coming at you from every angle, waving clipboards with ‘Vatican Tour – Beat The Queues’ written on them. They kept trying to sell us tours in spite of me clearly getting peed off. My new tactic when they ask if ‘speak English’ is to play dumb and say ‘a little’ and then watch their faces drop as I fail to understand ……..
Every day up to 25,000 people descend on St Peter’s Basilica, the epic Renaissance centre of Catholicism, and the 54 masterpiece-packed galleries of the neighbouring Vatican Museums. Before you visit go online and prebook your tickets, it will save hours in the entrance queue ! Since they’ve all read the same guidebooks, like we did, most arrive early in the morning to tackle the galleries first, hence the queues snaking round the block. 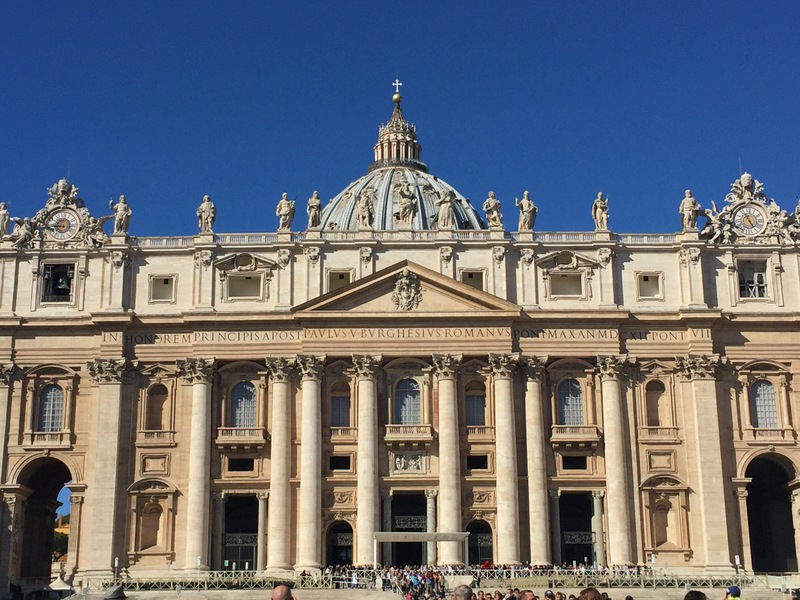 Don’t join them — instead, go straight to St Peter’s, and join the line for the security section, which is like cueing at the airport, bags scanned and though the metal detectors and your in . Remember to visit St Peters Basilica, you must be properly dressed. no bare knees, midriffs or shoulders. Sandals and jeans are fine. Be careful when wearing knee-length shorts and skirts; the opinions of the Vatican guards as to what is acceptable may vary. In a pinch, you will find plenty of tat sellers just outside the Vatican, who sell t-shirts or scarves. 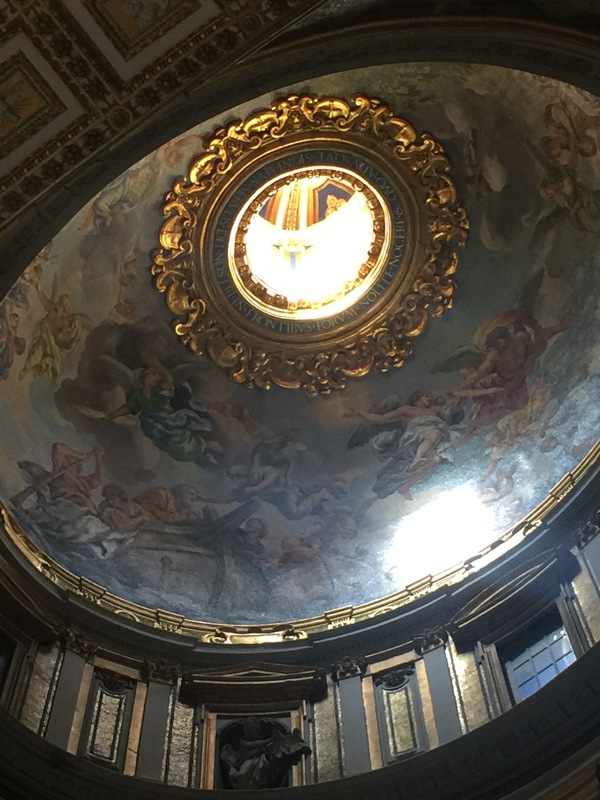 begin your visit with the church’s must-visit dome (abou €6 a person ). By afternoon it’ll be heaving, but at the 8am opening time you’ll have it all to yourself. The work of so many artists has produced a monumental work of sublime beauty. From here, you can exit straight down into the nave to visit the basilica, beating the crowds at the entrance. You can descend a little and see the area where some of the popes are buried. 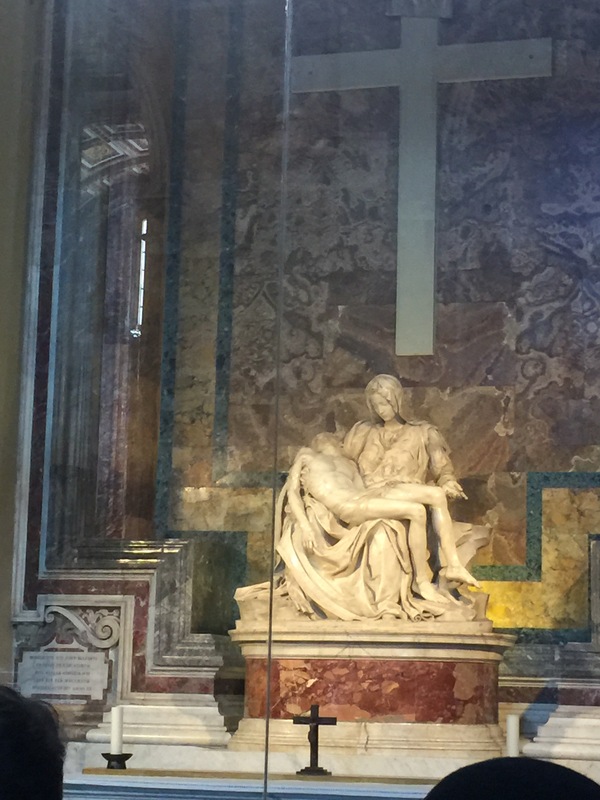 Saint Peter is said to be entombed just underneath the church. It’s quite interesting to visit the popes’ tombs – there is a lot of history down there. Don’t worry, it’s not dark or claustrophobic. 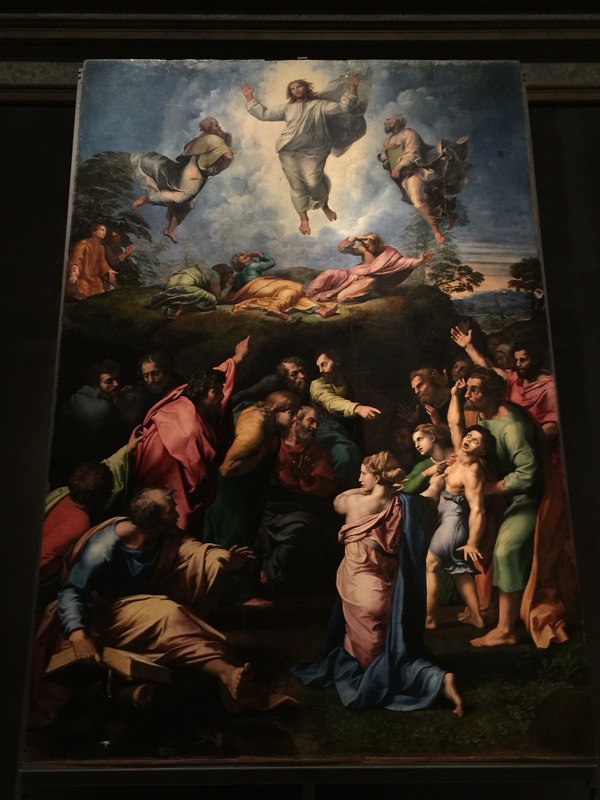 After lunch hit the Vatican Museums by the time you reach the iconic Sistine Chapel, close to the 6pm closing time, it’ll hopefully be relatively empty. 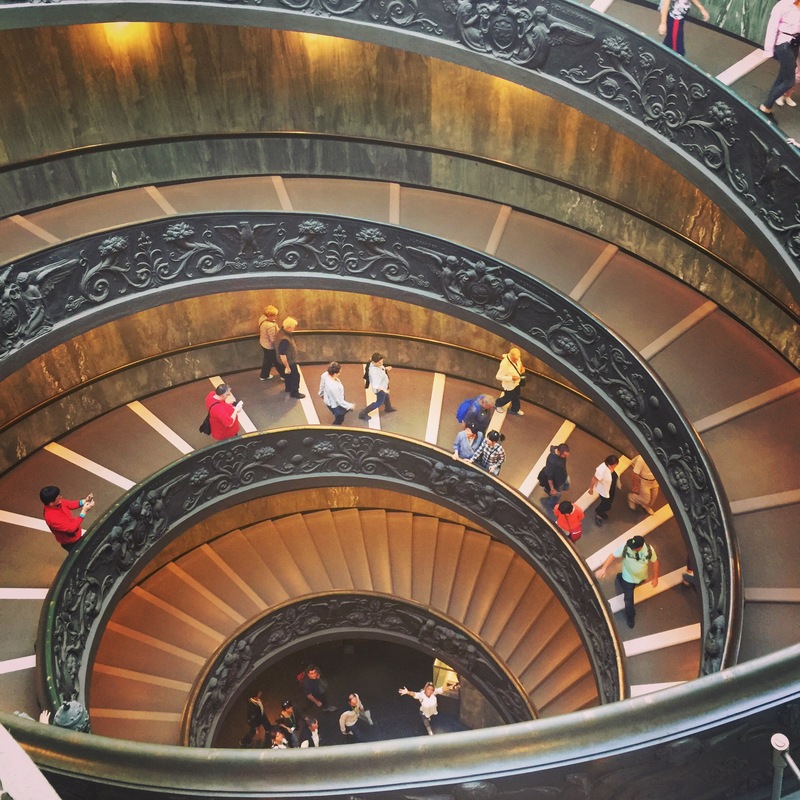 The Vatican Museums hold many famous masterpieces, but is viewing them really that great when you’re doing so over someone else’s shoulder? As we headed off around the epic museum, you could see the tick box tourists all jolising for a view of the top pieces. The famous Raphael Rooms are usually so full of tourists that it’s hard to do them any justic at all, we barley got a glance without someone pushing and point a camera in your way . But stealing away from the big named stuff and you are almost alone in the greatest Musem on this plant! 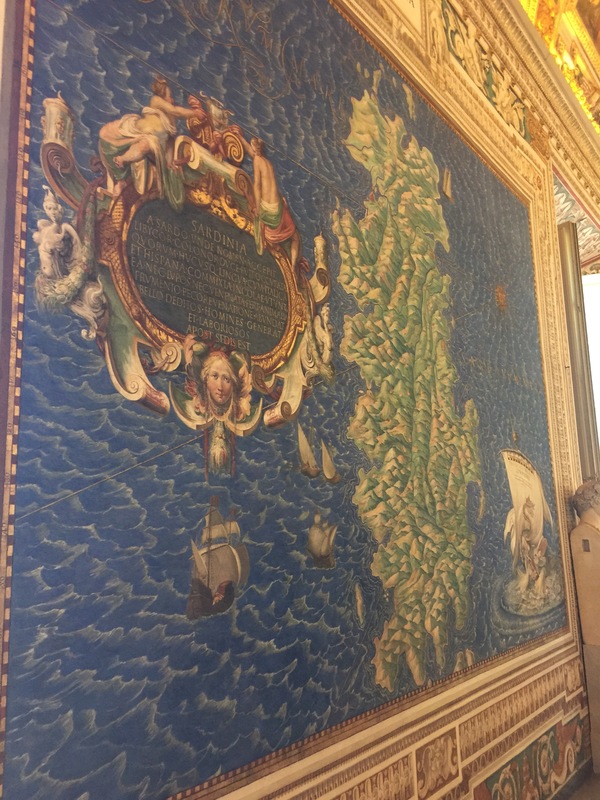 A completely unmissable stop for most is the Gallery of Maps, which is lined with topographical maps painted by Ignazio Danti, where Italy is divided into regions on this huge awe inspiring works of art. Now most people come here just to see the Sistine Chapel, considered one of the wonders of the world. 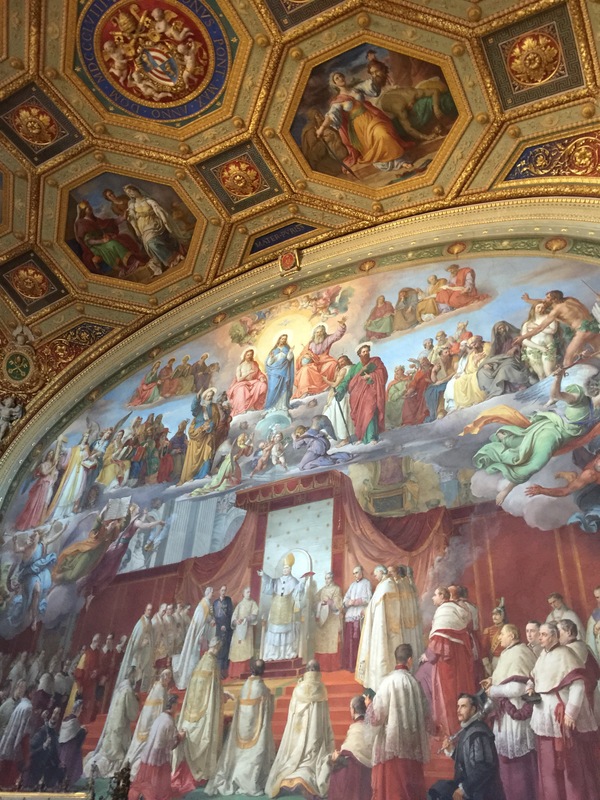 “Without having seen the Sistine Chapel one can form no appreciable idea of what one man is capable of achieving”. There are over 300 paintings painted in the whole Chapel representing scenes from Genesis. Michelangelo had never painted fresco before working on the Sistine Chapel. It took four years to complete the work. And No pictures ! – the Fun police will shot at you if you try ! And don’t forget that Instagram classic shot of the stairs as you leave ! The changing of the Swiss guard. The Pontifical Swiss Guards have served the papacy since 1506 “with courage and fidelity,” as their motto says. 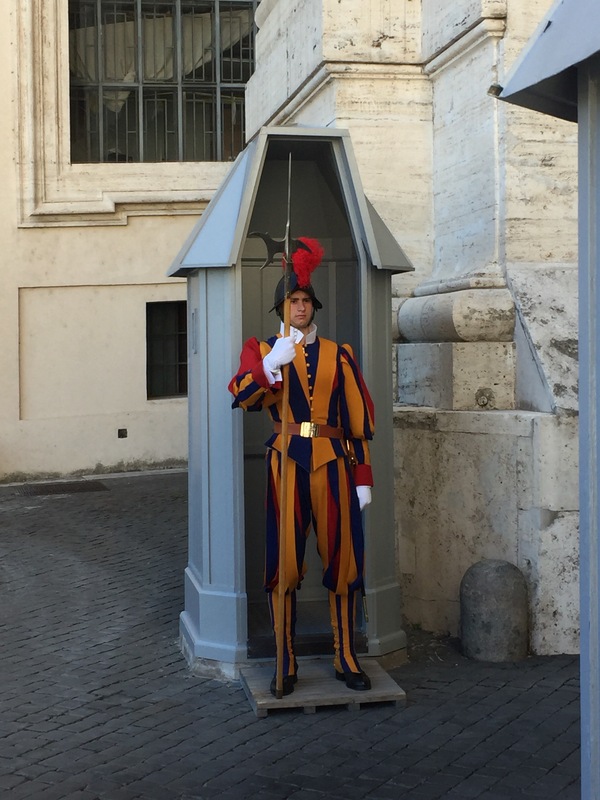 When you visit the Vatican, have a look at the changing of the Swiss Guards that takes place every hour, just right below the “Arco delle Campane” arch of bells, the low arch on the left side of St. Peter’s Bascalia. Back in 1929, when the Papal State was born, the Swiss Guard became the official militia; the maximum number was set to 100, plus six officers. Their job is to deal with the Pope’s vigilance and protection not only in the Vatican, but also during official ceremonies and during his travels. A glimpse of the Pope? I am not a religious person, but why would I not want to see the Pope ? Sadly our timings were out on this one but, On most Wednesdays (except for late July and August) , the pope holds an audience at Saint Peters. In colder months, it will be in an auditorium-type hall just to the left of the basilica. But at least you may see the Pope!